The vice president creates waves with comments in China, but he was right to make them. In the midst of an already diplomatically challenging trip to Japan, China, and South Korea, U.S. vice president Joe Biden managed to make life just that much more difficult for himself. The vice president had a number of thorny issues already on his agenda, such as advancing the cause of the Trans-Pacific Partnership, discussing how to make progress on North Korea, trying to get Japan and South Korea on the same page, and most importantly, trying to persuade Beijing to step back and renounce its establishment of an Air Defense Identification Zone (ADIZ) that overlapped with the pre-established ADIZs of South Korea, Japan, and Taiwan or at the very least, to avoid declaring any new ADIZs. At first glance, his remarks seem at best impolitic, at worst downright harmful to the overall cause of furthering cooperation with China. Yet, upon further reflection—which the vice president may or may not have undertaken prior to uttering his call to arms—his comments signaled one of the most important policy thrusts of the entire visit. As China cracks down politically at home and promulgates its own ideals abroad through its Confucius Institutes and state-run media, it matters that U.S. officials reiterate American political values. Not doing so in an effort to appease Chinese sensibilities not only is craven but also doesn’t win any favors from Beijing. This past week during his own visit to China, U.K. Prime Minister David Cameron showered nothing but praise upon his Chinese hosts; in return he earned a scathing editorial in the Global Times and was forced to stand by and watch as one of his journalist countrymen was barred from his press conference with Chinese President Xi Jinping. Similarly, when Bloomberg fired star reporter Michael Forsythe in November—apparently for leaking to the New York Times that Bloomberg was kowtowing to Chinese pressure by holding back on the publication of a politically sensitive piece—the news corporation was rewarded with nothing better than visits by Chinese police to their newsrooms in Beijing and Shanghai. In fact, Vice President Biden took on the issue of Chinese treatment of U.S. journalists and media companies directly in his talks with Chinese president Xi Jinping. U.S. media companies have long been stymied in their efforts to report openly and critically on China for fear of reprisals from Beijing. As Mark Landler reported in the New York Times, nearly two dozen New York Times and Bloomberg journalists are awaiting accreditation from Beijing; without it they will be expelled, effectively shutting down their China bureaus. The question now is whether the U.S. government will take further steps to pressure China on this issue. Would Washington be willing to delay the visas of Chinese journalists? Is there an issue of market access that could be advanced through the World Trade Organization? It may seem foolish to risk the overall relationship with China for such issues: The ADIZ, for example, represents a more immediate threat to regional security than access to China for U.S. journalists. However, the political values the vice president is advancing—transparency, openness, and accountability—in the final analysis are reflected not only in the way that China does business at home but also in how it behaves abroad. 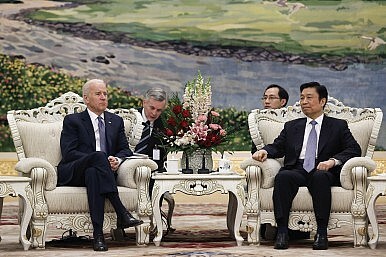 Biden is right to hold China to account on both fronts. At a regional summit, China and the U.S. promoted their divergent models for Asia-Pacific trade agreements. Biden's China Visit: A Failure to CommunicateUS Asia Policy: Things Fall Apart?With Obama MIA, China Touts Multipolar WorldWill Xi Jinping Visit North Korea This Year?Are the European Union and China Systemic Rivals?